+ What a stylish art style! MetaCritic score is 86 (PS4) & 88 (XB1) and OpenCritic dvore is 86. "Colossal in size, lavish in scope, Odyssey feels like a series landmark and Ubisoft's biggest ever game." "Throughout all of this, and because of all this, I was wary Odyssey would begin to feel bloated, but despite its length that's not a word I'd use. It's vast, there's no getting around that, but optional goat-hunting bounties aside the majority of your time with Odyssey is well respected." 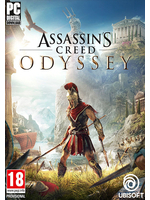 "Odyssey is an enormous game - certainly one of the biggest, if not the biggest game Ubisoft has ever made. It's an astonishing creation, extraordinarily generous and solidly crafted, and like its namesake is something that will live long in the telling." It's reviewing very well and EuroGamer saying "your time with Odyssey is well respected" is a great thing. I'm sure AC: Odyssey won't bring many people who dimissed the franchise many years ago, but moving the brand aside, seems to be a great game on its own right. 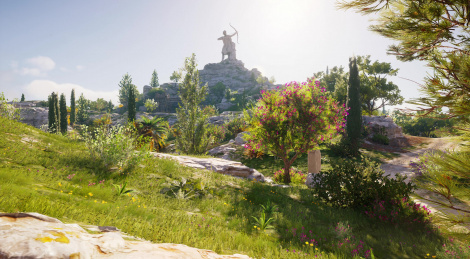 Can't wait to plunge uncounted hours into AC: Odyssey. "Missions aren't all memorable" Well, that's expected when you have more than a hundred missions. Not even all Witcher 3 quests were memorable. Origins was not bad but not good enough for me to finish it. Thanks for the review, maybe I'll try it. "Choices and conséquences in an AC game"
I not so sure if I'll enjoy this new aspect. I like games such as The Witcher series, Dragon Age Origins, old Mass Efftect tittles, Deus Ex Human Revolution, I'm playing Dreamfall Chapters and I have Life is Strange 1 waiting but sometimes I don't want to keep seeing the same "chose your dialogue option" mechanic. Assassin's Creed was one of those games that I could play once a week while talking with a friend without having to think what I said or did during "X" conversation and how that could change "Y" situation... I guess that's my problem, I'm the type of person who wants to see every option and possible outcome in a game and keeps replaying missions and reloading saves. Unlike AC: Origins, Odyssey is supposed to have the option to replay missions (or so they said) but I don't know how that plays out if some choices made earlier have an impact much later in the game. What does the last point in the Negative section, "... and weakness" mean?